The Dorchester Reporter takes a look at the candidates running in the Sept. 4 Democratic primary n the 5th Suffolk (Dorchester and Roxbury) district to replace state Rep. Evandro Carvalho, who is running for Suffolk County DA. The Jamaica Plain Gazette reports on a forum for candidates in the 11th Suffolk state representative's district: Incumbent Liz Malia and challengers Ture Turnbull and Charles Clemons Muhammad. Chynah Tyler, a former aide to state Sen. Sonia Chang-Diaz and a Roxbury native, is running for the 7th Suffolk state representative's seat from which Gloria Fox is retiring this year. Tyler unveiled her Web site today, although Politico reports she actually filed papers to run on March 16. Also running: Monica Monique Cannon, also of Roxbury. The State House News Service reports that state Rep. Gloria Fox is retiring at the end of the year from the 7th Suffolk (Roxbury, Mission Hill, the Fenway) district she's represented since 1985. UPDATE: Henriquez tells WGBH he's still wrestling with the question of whether to run. 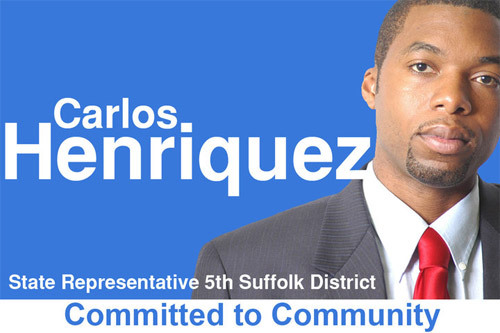 Former state Rep. Carlos Henriquez, who has maintained his innocence on the assault charge that got him sent to jail for six months and expelled from the House of Representatives, yesterday switched the header of his Facebook page to this image (although he's since switched that to another photo). Read more. It's Democrat Adrian Madaro vs. independent Joanne Pomodoro in a race to succeed state Rep. Carlo Basile, who left for a job with Charlie Baker. Polls open until 8. See the ballot, courtesy of Don. The Dorchester Reporter provides the results for the special election to replace Carlos Henriquez in the 5th Suffolk district. Evandro Carvalho will have to defend his seat in the fall elections. Chris Lovett moderates a forum on Sunday between the five candidates running in the 5th Suffolk district to replace Carlos Henriquez. The forum starts at 4 p.m. at First Parish Church in Dorchester, 10 Parish St. The Dorchester Reporter reports Dan Hunt won the Democratic primary, which means he'll be the next state rep, since there weren't any Republicans signed up to run. Henriquez makes his case to the House. The House of Representatives voted overwhelmingly today to expel convicted state Rep. Carlos Henriquez of Dorchester. In a speech to his now former colleagues, Henriquez insisted he was innocent and never attacked the woman who claimed he did in a Zipcar. In speeches before the vote, members of the House Ethics Committee alternated between saying a jury begged to differ but that even if they believed him, he would be unable to fulfill his duties as a representative while in his six-month sentence. MassLive reports on the impending vote to expel state Rep. Carlos Henriquez (Dorchester). The NAACP wants a delay. Howie Carr (yep) wonders why him and not the other elected wrongdoers. The Globe reports state Rep. Marty Walz (D-Back Bay) is resigning to become CEO of Mass. Planned Parenthood. State Rep. Carlos Henriquez (D-Dorchester) discusses on the House floor one of the reasons he won't be voting for any requirements to force voters to get IDs. The New York Daily News gives Mistah Speakah some space. The proposed state House and Senate redistricting maps are out (Boston-area House districts / Senate). The thing that hit me immediately, since, of course, I looked at our place on the map, is that a piece of Roslindale (specifically, ours) would get shifted from Mike Rush to Sonia Chang-Diaz. The South Boston state rep, who didn't seek re-election last fall, was indicted today on campaign-finance violations, along with his 2008 campaign treasurer, for allegedly failing to report $6,300 worth of donations that year.